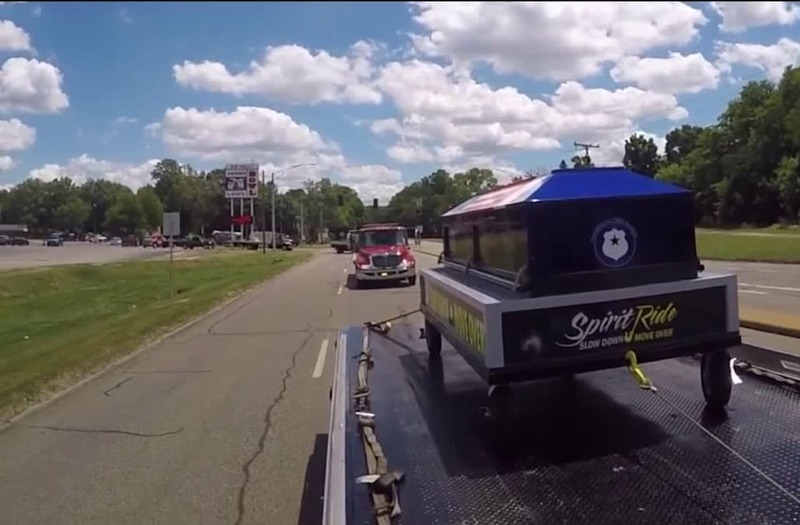 AKRON, Ohio (WJW) - A traveling coffin is turning heads as it passes through the state of Ohio during a two-year long journey across the United States. The display called the "Spirit Ride" is being held to draw attention to the "Slow Down, Move Over" law that is intended to save the lives of police, tow truck operators, first responders, safety personnel and everyone else who is working alongside roads or highways. The coffin is passed off from one tow truck company to another as it travels across the country. It stopped in Springfield Township, where police remember a 2011 incident when Police Officer Mark Dodez was hit and paralyzed by a driver on Arlington Road. A coffin passed from one tow truck company to another as it travels across the country is meant to draw attention to the “Slow Down, Move Over” law that is intended to save the lives of police, tow truck operators, first-responder and other safety personnel. "It was devastating, 2011 changed all of our lives forever. He is paralyzed because of it and we miss him every day here at work," said Sgt. Denise Moore. Statistics show that a tow truck operator is hit and killed on an average of once a week across the United States. Moore says she and her colleagues frequently have close calls while doing their jobs. "I think anytime - many times in a year - many times in a month - we all have close calls. We try to put on our reflective vests. We do the best we can to be visible, but it doesn't always work," said Moore. "We need to educate people on the "Slow Down, Move Over" law. Please, if you can get over a lane. Give them room. And it's not only tow truck drivers, it's everybody with lights on out there working on the side of the road. Give them room, they all have families," said Nancy Main, who owns Akron Coach Company. Mike Corbin is a song writer who travels with the display after being asked to write music that addresses the cause. He says the "Slow Down, Move Over" law is valid in every state but believes as much as 70-percent of the people on the roads are not aware of it. The display gets a lot of attention as it travels and he is inspired by the reaction to it. "I, along with my wife, am travelling around the country to raise awareness of the "move over slow down" law that exists in every state of the country - to get so that people move over when they see flashing light on the side of the road, whether they are police, towers, ambulance, fire, sanitation - anyone alongside the road they should move over," said Corbin.